Journal Table of Contents (TOC) services are available free via the World Wide Web. These can be set up as email alerts or RSS feeds. The JournalTOCs service allows you to set up alerts to a wide selection of international journals in different disciplines, creating a one-stop-shop for following relevant literature. 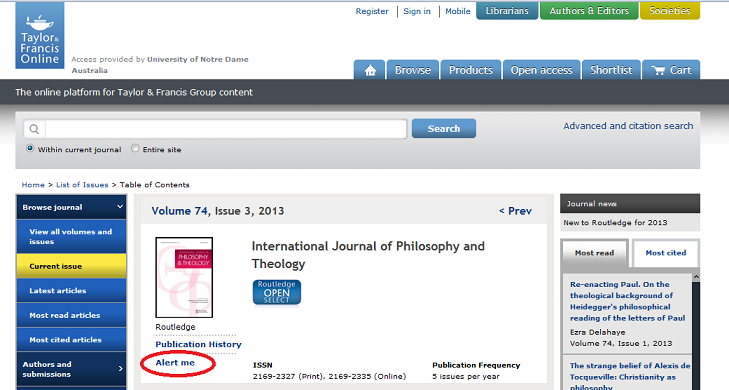 You can choose from subscription publications, hybrid or open access journals. Sign up for a free account to set alerts for your favourite journals, or search for articles, browse by subject or publisher to select the titles of interest. More information on using Journal TOCS can be found here. Most journal publishers will generally offer TOC services. Set up a free account with the publisher, and then from the homepage of the journal that you wish to receive alerts for, look for an option to sign up for alerts (see the examples below). 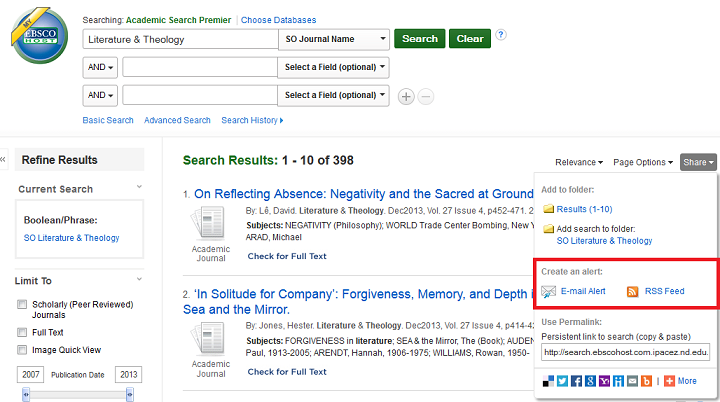 Journal TOC alerts are available from most databases. You will usually need to register a free account with the database before setting up alerts. Once you have registered, search for the journal title that you wish to receive alerts for and look for an option to sign up for alerts.